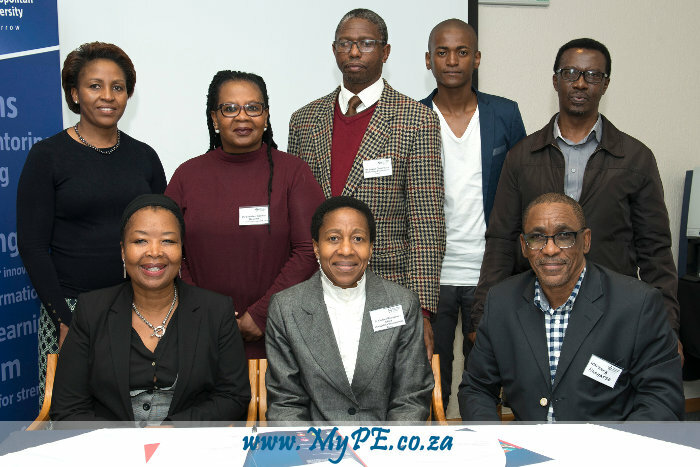 Front seated, from left: NMMU Deputy Vice-Chancellor: Iinstitutional Support Dr Sibongile Muthwa, iKamvelihle Development Trust founder Dr Lindiwe Msengana-Ndlela and Senior Director: Communication and Stakeholder Liaison Lebogang Hashatse sign the MOU with (back, from left) NMMU Executive Dean of the Education Faculty Dr Muki Moeng, Batandwa Ndondo Senior Secondary School principal Busisiwe Sidumo-Gqwetha, Ngcobo Education District Circuit Manager Loyiso Dingiswayo and Batandwa Ndondo teacher Sakhisizwe Nkwana and Raymond Khayanda. A long-term partnership aimed at addressing the myriad of educational challenges largely affecting rural Eastern Cape schools was rubber stamped, with the signing of a memorandum of understanding between Nelson Mandela Metropolitan University (NMMU) and the iKamvelihle Development Trust (iKDT) on Friday. The signing of the MOU is the culmination of a year-long engagement between the University, the iKDT and the Cala schools – during which various challenges were identified and possible solutions mapped. The partnership, which is a long-term one aimed at adequately capacitating and improving conditions at rural schools with a broader objective of diversifying the University‘s feeder schools, will lend support to teachers and pupils of schools in the Chris Hani District Municipality as well as their immediate communities. The project started with an initial 10 high schools and their feeder primary schools and will ultimately be rolled out to all schools in the district and beyond. Having identified a multitude of community and school-specific challenges that include poverty, lack of adequate infrastructure and a lack of exposure due to geographical location, an interdisciplinary team from the University has gone into the area in a bid to map out possible solutions to address the problems. Speaking at the memorandum signing at the University on Friday, iKDT founder Dr Lindiwe Msengana-Ndlela said the project was about education and development, targeted at improving the lives about 5000 pupils in Cala and its surrounding areas in the initial phase. “We started with 10 schools within the Chris Hani District Municipality, with the hope of expanding to all schools in the district,” she said. Msengana-Ndlela spoke about how, in post-apartheid South Africa, the education system had “a dual character of privilege and poverty”. “Teachers and learners from these areas are left to fend for themselves in a vicious cycle of generational poverty. This is a cucle that they intend to break with the support of partner organisations such as NMMU and responsible corporate citizens, whose resolve is to support government to invest in human capital development and to participate in the restoration of communities and contribute to a better world,” she said. To support the initiative, NMMU has thus far involved its Education and Engineering, the Built Environment and Information Technology (EBEIT) and Science faculties, as well as Admissions, Student Counselling and Career Development, Unako Community-based Movement and Communication and Stakeholder Liaison through various interventions. The Education Faculty is lending support to Foundation Phase teaching as well as envisaging and working towards the ideal school through the Centre for Community Schools, while the EBEIT Faculty will assist with the establishment of a community ICT Centre to train and empower teachers and community members as well emphasise the value of having ICT facilities at schools. The Science Faculty’s Govan Mbeki Mathematics Development Unit (GMMDU) will assist with maths and science education through the use of modern technologies and Communication and Stakeholder Liaison – under which student recruitment falls – to help with the provision of career and study choice information through annual exhibitions. This partnership is just one of numerous engagement initiatives at the University, aimed at using resources available at the institution to make a meaningful impact on the community in which it operates and from which it draws its stakeholders. The Cala partnership is in line with the University’s efforts at increasing access to students from rural communities, for whom a tertiary education may otherwise have been an elusive dream. NMMU Deputy Vice-Chancellor: Institutional Support Dr Sibongile Muthwa said as Engagement was set out as one of the pillars of the university, the project was just one of the ways of seeing this philosophy in action. “We support this initiative fully and we have been very keen to take our work to hinterland of our country, so I’m very proud of the elements of the university working on this and proud of our support to students from the point of entry to exit,” she said. Principal at one of the schools, Batandwa Ndondo Senior Secondary School, Busisiwe Sidumo-Gqwetha said when they were approached by the iKDT about the partnership that was to be formed with NMMU, they welcomed the initiative. The school is one of iKDT’s beneficiaries and has been part of the learner support initiatives spearheaded by the Trust to help pupils from Foundation Phase to tertiary education level. “As rural as the school is, we have hardworking teachers. With the coming in of iKDT and NMMU, we hope that our learners will be motivated to work harder. We promise that we are going to work towards success with both partners within this period and to strengthen the relations we have formed,” she said. Circuit Manager in the Ngcobo Education District, Loyiso Dingiswayo, also welcomed the partnership. “Due to a lack of exposure, people in the rural areas are sometimes not as developed as those in the urban areas. We therefore see this initiative as an opportunity to level the playing field for everybody so that there can be proper economic development,” she said.